The Jack Pine (above left) and The West Wind (right) are the most famous works by Tom Thomson, the romanticized hero of the Group of Seven painters who in the early 1900s recorded Canada’s rugged landscape in works that became symbolic of the Canadian identity. Centre: Franklin Carmichael, A Northern Silver Mine. Small paintings, from top left: F. H. Varley, Stormy Weather Georgian Bay; Arthur Lismer, Glacier Above Moraine Lake; Tom Thomson, Snow in the Woods; Lawren Harris, North Shore Lake Superior; J.E.H. MacDonald, The Tangled Garden; A.Y. Jackson, Winter, Charlevoix County; Frank Johnston, Fire-Swept Algoma. 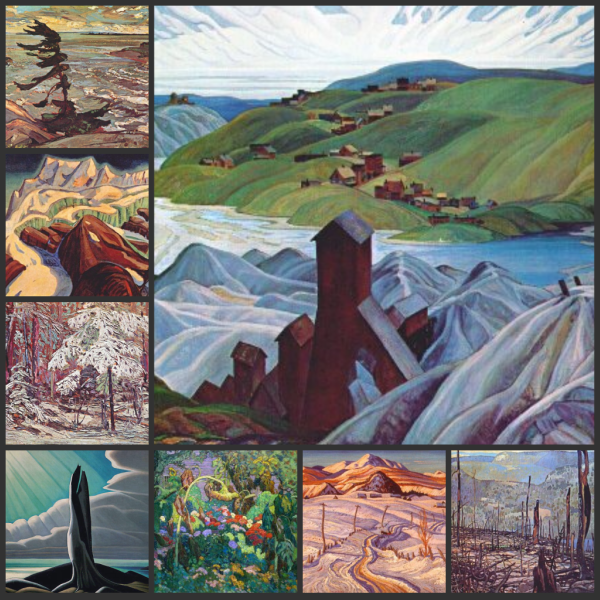 The original artists were Franklin CARMICHAEL, Lawren HARRIS, A.Y. 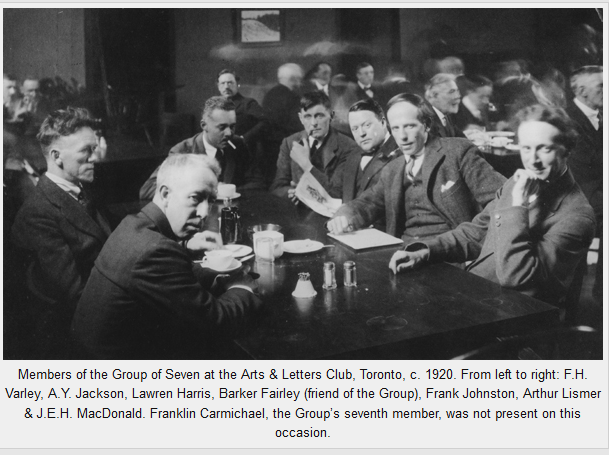 JACKSON, Frank JOHNSTON, Arthur LISMER, J.E.H. MACDONALD and F.H. VARLEY. They befriended each other in Toronto and moved their work rapidly and provocatively into a unique form of Canadian modernism that left the country’s traditional art world affronted. They were mavericks who mainly made their living as commercial artists and painted in the wilderness for joy. Millions of Canadians can name their favorite piece of art from the original Group of Seven or its later associates (mine is Emily Carr’s An Indian Church). But their work is largely unknown outside Canada. The heralded exhibit in London shows 122 landscapes — most displayed with their original sketches — and includes not only famous works from public institutions (the National Gallery of Canada, the Art Gallery of Ontario, the McMichael Canadian Collection) but also a significant number of seldom-seen works from private lenders. Interesting site! Thanks for visiting mine! Thanks, come back and visit anytime.